Formerly an ICT Researcher/Consultant, Onica now spends a considerable amount of time shuffling her little around to endless activities, trying to avoid the endless chocolatiers and cafés that have emerged throughout Delft center, and sporting (primarily tennis) to minimize the impact of those failed attempts. It’s that time of year again; time for expressing your love whether it’s towards a partner, a parent, a child or a friend (and yes, for some, that extends to four-legged ones). After all, most of us love someone or something. 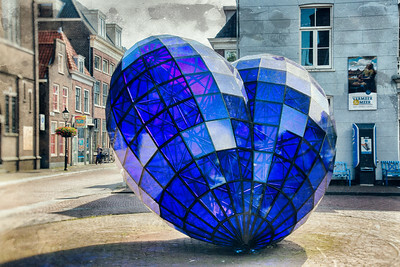 In honor of Valentine’s Day, the Delft Mama team decided to pull together a quick survey to find out a little more about the origin stories of couples in the Delft Mama community and how you all plan on spending your Valentine’s Day. As a young adult, I remember Valentine’s Day signaled a time for romance. When you took the time out of busy schedules to acknowledge the importance of that special someone in your life with a romantic dinner out, a lavish bouquet of flowers, a coma-inducing box of chocolate, or even a cliche greeting card. Fast forward a few years, a transatlantic romance and a rambunctious little version of us, Valentine’s Day now becomes a very different day. 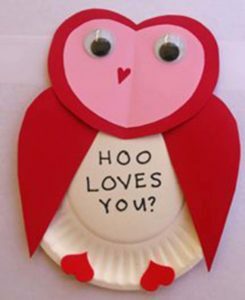 One that triggers the need for copious amounts of glue, sparkles, red craft paper and an assortment of pens to help a certain someone make ‘valentines’ seemingly for every member of his family and peer group. How did we get to this version of Valentine’s Day? 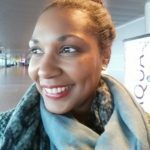 When first conceiving this post I thought it would be a nice idea to learn how fellow Delft Mamas (or Papas) met their partners in the first place. I imagined a high percentage of us, me included, met our other half while on vacation out in a social setting, others perhaps while away at school, and even some with that quintessential story of childhood sweethearts. In actuality, that speculation wasn’t far off base. The results from our admittedly small sample of 43 responses, tells a familiar story. 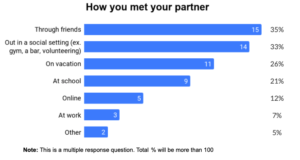 At 35%, meeting through friends surfaced as the number one way to meet your mate. And those ridiculous ‘reality shows’ about finding love abroad are not for nothing. A 2014 Intrepid Travel pseudo study suggests travel puts you in the mood for love. That apparently holds true among our sampling of survey takers, with a quarter of us meeting our future mates while traveling on vacation. Amidst the expected results there was one I didn’t anticipate. Given the ubiquitous nature of the internet, I was somewhat surprised to see only 12% of those taking the survey met through a dating app or online. But with a whopping three-quarters of us having met our partners seven or more years ago, perhaps we weren’t all yet so entrenched in the online culture back then. For more than half of us, the language of love wasn’t one we were born to. And with the exception of two or three of our survey takers, the most convenient way to communicate as a couple is to stay in the language you were using when you met. It’s easy to fall in love, even without words. Unfortunately, learning a language doesn’t become easier even if you’re in love. So extra kudos to you if you made an effort to learn a new language for love. 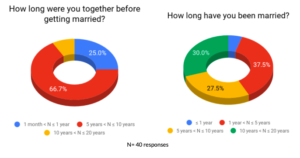 Once cupid’s arrow strikes, over 90% of us march to the altar, registrar’s office, or ceremony of choice to say “I do.” In fact, after the initial adrenaline rush and pheromone buzz, it took between 5 and ten years for over two-thirds of our respondents to make that decision to marry. And once they did, quite a few took the show on the road. Almost half of our respondents completed nuptials in foreign locations. So. Now on average seven-plus years down the road, most of us are married with one, two or many little ones in toe. And what do we do to celebrate Valentine’s Day? Well, apparently absolutely nothing at all. 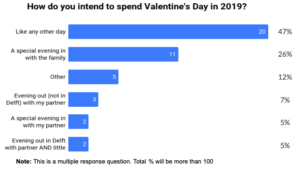 Near half of our respondents indicated they’d be spending Valentine’s Day just like any other day. While another 25% plan on spending a special evening in with the family. Our non-married couples, however, seem to continue the tradition of grand gestures, with romantic evenings for just two, or extended weekends away. My husband had his typical smarmy remark that “every day is a romance with you” when I shared these numbers to not so gently hint for a bit of romance on his part. And yes, I do realize I could be the one to make the gesture. But indeed, we shouldn’t rely on a single day to remind us to acknowledge the importance of those special people in our life. It should, in fact, be an everyday occurrence. Then again, I wouldn’t say no to some of the ‘other’ Valentine’s Day plans of those in the Delft Mama community, like a trip to see the northern lights in Tromso with their baby. Did I hear a collective “awwwhhh”? So there you have it. A quick glimpse into how some of your fellow Delft Mamas met their mates along with a sampling of their plans for Valentine’s Day. Valentines Day has become a lot more inclusive, with Valentine cards for children, grandparents, nannies and even dogs. The Delft Mama community seems to have taken this inclusiveness on board. Seriously, I saw a little chihuahua dressed in a pink bomber jacket being pushed around Delft in a doggie stroller this weekend. But I digress. So this year, as I sit at our table with the little, making cards in Dutch and English for anyone important in his life, I’ll be comforted with the knowledge that many in our very diverse community may well be doing the same. But I’ll also take inspiration from those creative adventurists among us and perhaps plan a little adventure for our little tribe for next year.